Over on thread in Ravelry I mentioned I had made use of Yarn Harlot's Sock club idea—and put together some sock kits. An idea seen here last (maybe not last, but most definitely not first!). She made up a dozen—and put them on a shelf. Now each month, she has a sock kit waiting for her to knit. It's not a palidrome, (A man, a plan, a canal, Panama!) but it is a good idea. I've taken to planning a pair or two ahead—and packaging up yarn, a notation on a pattern idea (since I rarely use a pattern—unless I am test knitting one of my own patterns!) --a set of needles (I have several duplicate in the same size, and work with different sizes (anything from a 0(zero) to size 2) and a card noting what else is needed. (markers, etc)--which could include a cable needle, or a length of waste yarn for an after thought heel. My small notions bag with a tapestry needle, gauge tool and a tape measure, automatically gets moved. Right now, I am contemplating the Roy G Biv socks—straight simple stripes? Or small chevrons? Or pattern of boxes or diamonds of color... or should I spell out Red in red, and Yellow in yellow? Or use a slip stitch pattern? So many options to think about just with the colors. A pair of Crazy 8 socks. 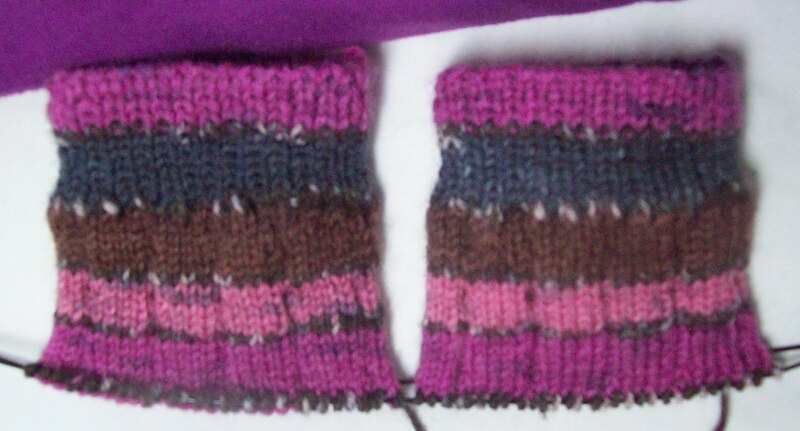 With 8 vertical stripes--definitely Vertical stripes—some solids, some self striping. Should the stripes be plain? Should they be flat, or raised I cords? Straight, or spiraling? Thick and thin? Or maybe cabled with big wide crosses (traveling stitches) to make a bunch of 8's!? And how will I knit them? Flat and seamed, or in the round? Problems to resolve with vertical stripes. Why is 48 pairs too many? What is the right number? (Is there a right number?) How many socks do you have? How many have you knit? In the past 10 years, I also knit 2 dozen pairs for gifts and charity; 2, for me, 1 for someone else. Not a bad ratio. I don't feel the least bit guilty owning 4 dozen pairs of hand knit socks. Oh yeah—Finished--Cotton Candy socks.. (5 inches tall in leg/cuff--short, but enough. And Started (see, it matches clothes—the color in the corner is just one of 3 T's I have in this color (all slightly different) ) And I am documenting the pattern, too. There is no such thing as too many pairs of socks. I should try that self-sock club idea too. I love the Yarn Harlot's sock club idea. I started doing that with my stash (obviously not with socks, since I haven't tackled that yet) but with other stuff. Print out the pattern/photocopy it/whatever, put it and the yarn in a see-through plastic bag of one sort or another (sweaters unfortunately don't fit into gallon bags) and that way I'm not digging through my stash trying to remember why the heck I bought that yarn. I have probably 4 dozen cheap, crappy, cotton socks that I would gladly trade for 4 dozen hand knit socks! Love that you are doing the self imposed sock club. If I could buckle down and knit a pair of socks a month then I would try it too. Like the newest socks. Great colors!